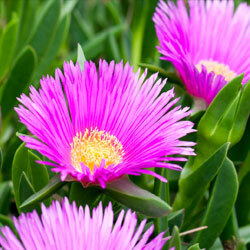 “Ice plants” refer to several types of plants, usually succulents with fleshy thick leaves in cool green-blue colors. However, after an introduction to Delosperma, you’ll know it as the real deal. As a group of tough groundcovers, these blooming succulents flourish in full sun in well draining soils with little water, once they are established. Plus, they’re amazingly colorful! Native to Africa, with fleshy, clustered green leaves, Delosperma species and varieties solve many common groundcover, erosion and container garden needs. From only ½” tall and a few inches wide to 4 inches tall and spreading to 2 feet wide, Delospermas begin blooming with daisy-like flowers in early spring and often continue blooming through the summer. Depending on the variety, these perennial succulents punch up the garden with bright fuchsia, red, bronze, yellow, white, lavender or orange flowers, and several variegated or two-toned blooms are available as well. A more adventurous gardener can turn up the heat with Delosperma ‘Fire Spinner.’ It quickly grows to an attractive weed-thwarting 2 inches high and 15 inches wide mat in two seasons. The variety name perfectly describes the flowers. It’s a kaleidoscope of hot colors on unbelievable 1½” wide fiery flowers. Radiating from a clear white center, petals with deep magenta color in the middle transition to hot orange, finishing with bronze on the outer tips. These arresting flowers sit atop shiny, apple-green needle-like succulent leaves making an astonishing garden statement from late spring through fall. What an unexpected showstopper! Most gardeners are all too used to the finicky habits of their favorite plants, from precise soil pH levels to a specified amount of sunlight to a unique cocktail of soil fertilization and amendments for the best growth. Not so with Delosperma – all these plants ask (it’s more of a demand, really) is good drainage. With that, they’re fairly self sufficient – easy to care for and requiring very little maintenance. Birds, bees and butterflies love Delosperma just as much as gardeners, but deer don’t, making these plants ideal for areas where deer are a bit too friendly in the garden. They work well as borders or to soften the edges of buildings, walkways and driveways, and they’re right at home in well-drained terraces, rock gardens and xeriscaping. Whether you live in a naturally drought-prone area or just want to conserve water without sacrificing color and beauty, give Delosperma a try and you won’t be disappointed!